Hall Marks on English Sterling Silver usually have four or five components, although very small pieces often are incompletely marked. 1. The Standard Mark. This is a Lion Passant and shows that the article is sterling silver, i.e., that it contains 925 parts of pure silver per 1000. 2. The Mark of Origin. A symbol indicating the location of the office of assay. The London Guild mark is a Leopard's Head, surmounted by a crown until 1821, uncrowned since that date. 4. The Date Mark. Letters of the alphabet, varied in style or in the shape of their surrounding shields, denote the year of assay. 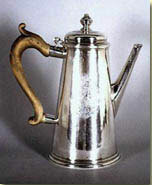 Each guild used its own series of letters and London marks must not be used in determining the date of provincial silver. 5. The Duty Mark. From 1784 to 1890, a tax was levied on each piece of silver assayed, and the reigning sovereign's head was used to show that it had been paid. No laws govern the marking of plate wares. Old Sheffield Plate, all of which was made before 1840, is usually unmarked or has the maker's name or symbol only. Plate wares marked "A1," "EPNS," "Sheffield," "Silver on Copper" or "Silver Soldered" are modern electroplate. European Silver is marked according to the laws of the individual country. The numbers "12" or "13" refer to the purity based on a total of 16 units. Modern European silver bears the standard mark in decimal units, for example 800/1000 fine. The United States has no official hall-mark system. Objects made before 1868 have the maker's name or initials only, sometimes with the word "coin." Later pieces are marked "Sterling".